It was reported previously that many MANUS users thought that the MANUS was useful, but not useful enough to gain totally independent lifestyles for several reasons; it moves too slowly, it cannot handle heavy goods, and its manipulative arm is not long enough. It would technically be easy to develop a faster, more powerful and bigger robot than the MANUS to meet these requests, however, such a high performance robot would be too dangerous for everyday use. The consideration of safety aspects is especially important for rehabilitation robots with higher performance entering the market. The problem has been discussed in a special committee of the Japan Robot Association according to ISO. 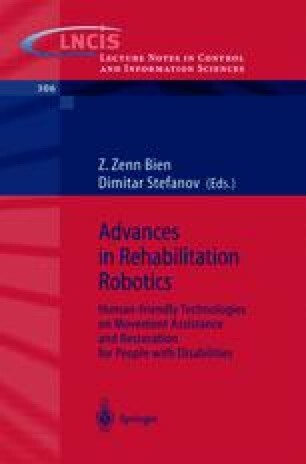 In the paper, a safety strategy for rehabilitation robots is proposed as a result of the discussion.